The new servo press solution is the latest example of how Festo solutions incorporate productivity. The servo press kit is a pre-assembled system consisting of modular operating software and harmonized Festo components, including electric spindle drive, motor, motor controller, force sensor, and control system. Customers simply integrate The Festo servo press solution into the press-fitting application. The operating software is ready to use as soon as system integration is complete. No programming skills are needed as the set up process is intuitive. Application-specific functions can be displayed on PCs, tablets, and machine mounted interfaces. Function elements in the software’s integrated library quickly configure and easily implement joining processes. Monitoring the process is simple. Critical process and quality information are displayed clearly and logically as well as recorded for reporting and optimization purposes. The servo press solution is shown in an active demonstration at the booth. In two other active demos, Cartesian robots are utilized to assemble batteries and handle electronic components. The new universal compact, yet high flow VUVG range of solenoid valves and valve terminals are on display. Visitors may request a free sample to be sent following the show. A collection of grippers illustrates the company’s emphasis on economy, variety, and flexibility. Customers looking for flexible, low cost fieldbus connectivity will find CTEU fieldbus module an innovative solution. The CTEU bus node inexpensively opens up DeviceNet, CANopen, CC-Link, EtherCAT, PROFINET, PROFIBUS, Ethernet/IP, Modbus, and AS-Interface to five different families of Festo valve terminals. Broad application contributes to lower inventory requirements. With the addition of an adapter, a single CETU node can also provide fieldbus connectivity to two valve terminals at the same time. The Handling Guide Online (HGO) configurator for Cartesian robots is a new productivity tool that significantly reduces engineering overhead. Equipped with basic application information such as load, cycle time, load voltage, and workspace size, a design engineer can specify a single axis, 2D or 3D Cartesian robot and receive a CAD drawing of the robot in about 20 minutes. Quotes arrive on average within 48 hours. Users have the option of ordering Cartesian robots fully assembled or as disassembled modules. Active and static Cartesian robots are displayed throughout the Festo Semicon West exhibit. The new Optimized Motion Series (OMS) of packaged linear and rotary electrical axes solutions helps lower overhead by speeding up specification, assembly, and commissioning of linear axes. The OMS solutions combine a set of rugged and dependable linear and rotary electromechanical actuators, motors, drives, cables, and mounting hardware with fast and simple specification, assembly, and configuration. Complete OMS axes, including actuator with mounted motor, drive cables, and assembly hardware, are ordered using a single order code and delivered in one box. To further simplify the process, customers use the same OMS code for repeat orders. Customers can rely on delivery in as little as a few days. Electric linear axes will be on display at the Festo booth. The FAST Mobile App gives customers quick and easy access to the Festo FAST catalog, which features a complete line of automation components with “Same Day”, “3 Day”, and “5 Day” availability. Users can navigate through the FAST product selections for technical information, pricing, and delivery. The mobile app is also an on-the-go solution for tracking and managing product orders. Download the FAST Mobile App from the App Store or Google Play. Local Festo distributor, Powermatic Associates, will also be displaying a variety of unique Festo products and solutions at booth # S1317. 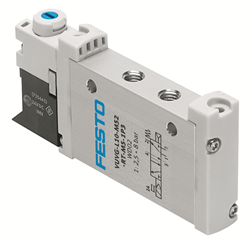 For additional information about Festo world-class productivity enhancing solutions, call 800-993-3786 and/or visit https://www.festo.us.